OH MY GOD....WOW. I didn't think I could love the series anymore than I already did, but this book just blew my mind. I've got to say that Cinder is probably my all time favourite lead female character. She is just so awesome! I also loved the new Cress story line and Thorne was even better in this book than the last and Prince Kai was just as wonderful! There was so much more character development in this book, you would think that by adding more characters things would start to get lost and there would be a sacrifice in character development but there really wasn't. 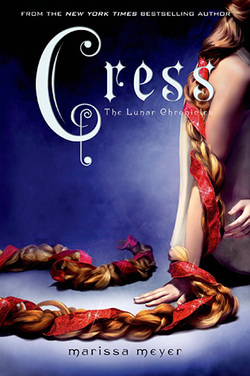 I loved all the new characters, Cress is so adorable and Winter... is CRAZY, but in such a cool way. I am very much so looking forward to reading the next book to see even more of her! I always love how each characters story lines are slightly different but they all intertwine, just wow, I love Marissa Meyer's writing style. This was such a great third book, I really wish this series would go on forever! I have yet to be disappointed! LOVED IT! Me... waiting for Cinder and Kai to reunite!